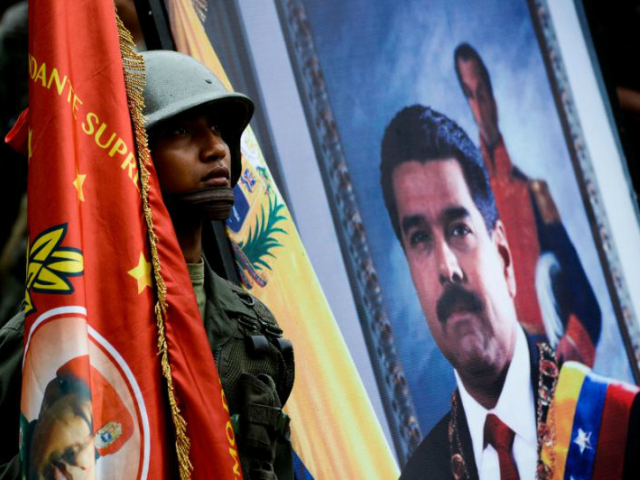 Venezuela’s Maduro Tells Military to Prepare for War with U.S.
Venezuelan dictator Nicolás Maduro has told his country’s military to prepare for war with the United States as the White House continues to impose sanctions against his increasingly authoritarian regime. “It is time for work, time for dedication, time for training, it is time to prepare, it is time to secure every inch of our land,” he continued. Maduro made the declaration during a military parade in the city of Maracay this week, two days after White House announced further travel restrictions on Venezuelan government officials and their families. It remains unlikely that Venezuela could pose any serious military threat to the United States, given the growing disunity within its ranks and health of its soldiers, many of whom are suffering from malnutrition as a result of the socialist country’s worsening humanitarian crisis. In recent months, the Trump administration has continued to exert pressure against the Maduro regime, which consolidated its power in August through the creation of a fraudulent lawmaking body known as the “national constituent assembly,” filled exclusively with pro-government stooges without any sort of democratic mandate. Previous sanctions include a ban on Americans from dealing in Venezuelan government debt or that of its state-run oil company, as well as personal sanctions placed against Maduro and other government officials. As a result, Maduro has accused the United States of waging an “economic war” against Venezuela. Meanwhile, Trump has previously revealed that he is considering a military solution to the country’s crisis.